It’s easy to forget about this dust and just deal with it by removing any specks in your photos later in Photoshop, but sometimes those specks won’t always appear on a nice blue sky, so it’s important to keep your filters and lenses super clean at all times. 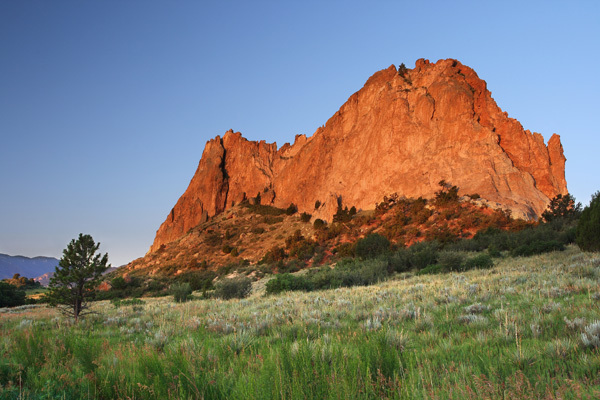 The problem with the second speck on the right is that half the speck appears in the blue sky, and the other half is on the red rock. This makes it more difficult to correct in post-processing. Certainly do-able, but also more time consuming. And, it may not be a huge deal with landscape images, but what if this happens on a critical edge in one of your close-up flower photos? You might end up spending a great deal of time correcting something in post-processing that you could have prevented earlier by just cleaning your lens (and that would’ve only taken a few seconds!). So, ideally, you want to prevent these dust specks by keeping your lenses and filters super clean. As part of your photo setup process, you should remember to check the front of your lens and brush off any dust or clean any smudges. When you clean your lenses though, it’s important to use a cloth that’s specially designed for cleaning glass. My favorite is the Spudz Micro Fiber Cleaning Cloth (affiliate link). I love how they fold up nicely into a little pouch and have a hook that you can attach pretty much anywhere. If you don’t use one of these special cleaning cloths, you could risk making your lens even worse! I’ll admit that when I first got into photography, I once tried to use my t-shirt to clean a filter and ended up totally ruining it (it was just one of those cheap Quantaray filters though, so I don’t feel too bad, heheh). You can also prevent dust from gathering on your lens by always keeping a lens hood on your lens. It may not help too much for the wide angle lenses, but if you have it on your telephoto lens and walk with your lens perpendicular to the ground, you’ll significantly reduce the amount of dust that ends up on the lens (assuming you walk around with your lens cap off). Another way for dust to get onto your lens: I was wondering why my filter lens keeps getting dusty even when I always keep the lens cap on, until I discovered that the inside of my lens cap is coated with dust. Thank you for providing such valuable tips and information. In this case, the “dust specks” are extremely hard to see on my laptop computer monitor. 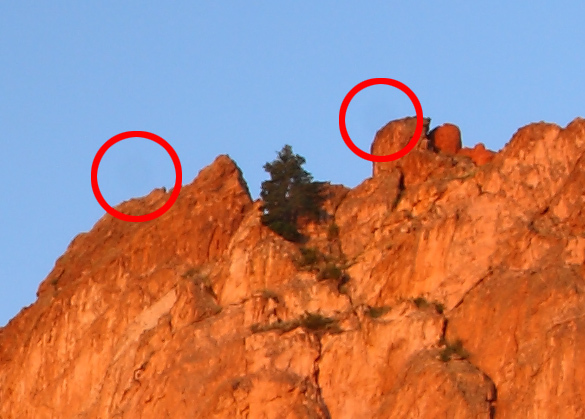 I would not have noticed them at all if they were not circled and then I had to view them from several different angles in order to finally see a couple faint shadows. Do many of your subscribers have this same problem? I am new to photography and wondering if I am wasting my time trying to edit photos using this monitor. @Edric – Great point! I totally forgot to mention that–I’ve noticed the same problem too.. so, I make sure I’m really careful where I put that lens cap. Even putting it in the same pocket as a napkin can be disastrous. @Gene – Does your laptop have one of those “glossy” screens? I’ve noticed that on my MacBook’s “glossy” screen, it’s really difficult to see dust specks. One thing that helps you spot them though, is if you look at the screen at an extreme angle (sounds like you’ve done that though).. There’s probably a trick you can do in Photoshop too, but I haven’t discovered one yet. Perhaps I’ll do some more research and write a post about it soon. I swear you must have superman vision, Steve. Even with the spots circled I can’t see any dust at least I can’t on this particular monitor. You and Gene bring up some good points about the lens cap. I normally just put mine into my back pocket and leave it there until I put it back on the camera. I guess I’d better find a better spot to put it while shooting. What technique do you use to clean your lens? About all I’ve ever done is blow them off with a rocket blaster as I’ve been afraid to actually touch the glass with a cleaning cloth. Do you wipe in one direction or do you wipe in a circle as if you were cleaning the lens of your glasses? The reason some are hesitant to always have a filter on their lens is that when you pay $1000-$2000 for a nice f/2.8 zoom or several thousand more for a telephoto, you’re taking all the technology that goes into creating flare-free clean images (special coatings, precisely shaped lens elements, etc), and slapping a $50 piece of glass in front of it. Thereby potentially creating a scenario where you’re increasing the likelihood of flares, modest softening, discoloration or other problems. Obviously, if you’re going on safari or any scenario where you’re subjecting your lens to flying debris / dirt / sand, you’d be nuts not to put a filter on it but in many situations judicious use of the lens cap and a hood can go a long way. Whenever I’m done shooting a subject when I’m on “walkabout” with the camera, I cap the lens and don’t uncap it until I find the next cool thing. This article has taught me that I don’t really need to worry about dust on my lens, because it is impossible to see in the pictures! This could have been a good article but in the end all you are saying is “Use a lens cloth” (and promoting your favorite) and “use your lens cap”. No explanation of how to even use a cloth correctly, no mention of lens tissue or cleaning liquids or compressed air. Example photo is good though and nicely illustrates the problem. I work hard to keep lenses and filters clean, but sometimes it is not always possible. I was trying to get a photograph of my 3 year old grandson riding a horse, a really large horse! The horse licked my camera, rendering the filter useless. I was glad it was on, because I was able to remove it and keep shooting. But Yuck! It was so hard to clean when we went home. I’m just glad it wasn’t my lens he got. I use the micro fiber cloths I get from my optometrist. I copied the image with the circles into Photoshop and zoomed in to over 500% to see if I could see what you’re talking about, and still couldn’t detect any spots.I know I’m blind, but I didn’t think I was that blind. Just a quick comment to tell you how much I continue to enjoy and appreciate your photography tips. The comments are always interesting too. I’ve never even thought about dust gathering on the lens cap and transferring to the lens. The pollen here in middle Alabama is very thick right now and collects on everything – on lens and subjects alike. Very hard to stay ahead of it. I photographed red flowers yesterday and once the pictures were in the computer, I realized they were covered with specks of pollen. Guess pollen could be gently blown off of the blooms or maybe sprayed off with water? @Zack – I think the spots are harder to see on some monitors (especially those glossy laptop screens). That may be the problem, but the spots are also pretty faint anyway (not as bad as those REALLY dark ones you get sometimes). With the cloth, I just go in a circle around the lens.. sometimes I blow on the lens, but I never use compressed air. @Dan – I agree, and that’s why I think it’s important to use multicoated filters on those expensive lenses.. and avoid the cheap ones. The multiple coatings help reduce the reflections. @Chip – I’ve noticed a lot of people don’t understand the importance of using a specialized cloth and end up using their t-shirt or a napkin for cleaning their lens.. so, that was one of the things I wanted to make clear with the post.. I confess that I was one of those “t shirt cleaner” people.. And, I guess I thought proper use of the cloth was pretty simple: just wipe off the dust and go in circles for smudges (just like cleaning a mirror at home). I don’t use any kind of liquids or compressed air though, as I like to keep my gear to a minimum. @Kathy – Good example of why you might want to keep a UV filter on your lens 🙂 And, I think any kind of micro fiber cloth made for cleaning glass will work fine (including the one you use for your glasses!). @marcus – The specks are pretty faint, unfortunately.. but, you can see them more easily if you view your monitor from an angle. @Sylvia – I’m not sure about spraying water on your lens, but for pollen I’d just try blowing it off the lens (maybe even use some compressed air). Another great post! I agree about the high quality cleaning cloth and lens hood. Those are essentials. I am all for keeping photo equipment (including lens / filters) clean. However, it would have to be a serious high density particulate to be visible in the end result. Anyway, the rear element or sensor is what I would suspect to be a likely culprit when it comes to dust clouding your image. To be honest, I can barely make out the specks you mentioned. I do notice the heavy vignetting caused by the CP filter. When using CP filters, vignetting can minimized by watching your relational angle to the sun. Anyway, keep up the great posts. Best wishes. A nice post and some good info Steve. I love the Spudz cleaning cloths as well and have them on my camera straps so they are always handy. Another option that you can use if you don’t have a special lens cloth or tissue is to use cigarette rolling papers. They are available all over the place. I keep a rocket blower in my camera bag and almost always give my front element (don’t use ‘protective’ filters) a couple quick blasts of air to clear the dust away. Much easier and faster than digging out a cloth or tissue. Are you sure the spots on this image are on the lens/filter and not on the sensor? This looks like sensor dust to me, but I could be wrong. I do try to keep my lenses dust free but in the end, I’m focusing way past the dust and it’s not showing up in the photos. Sorry, dude, I’d rather spend my time taking more photos than wiping tiny specks off of my lens.